While for many Canadians the CEF attack at Vimy Ridge in April 1917 is Canada’s defining moment in the Great War, in many respects the more important period was the final Hundred Days from the Battle of Amiens on 8th August 1918 until the Armistice came into effect on 11th November 1918. During this time four Canadian Divisions fought more than 50 German divisions in the field, and were in action almost every day of that hundred day period, including the last moments of the war when the final British and Empire casualty was a Canadian; George Lawrence Price, who died at 10.58am. Commanded by Sir Arthur Currie the Canadians exemplify the changes in the whole British Expeditionary Force of which they were a part and showed that by 1918 commanders in the field were able to fight and win modern battles, using all arms of service working together in a modern and innovative approach. 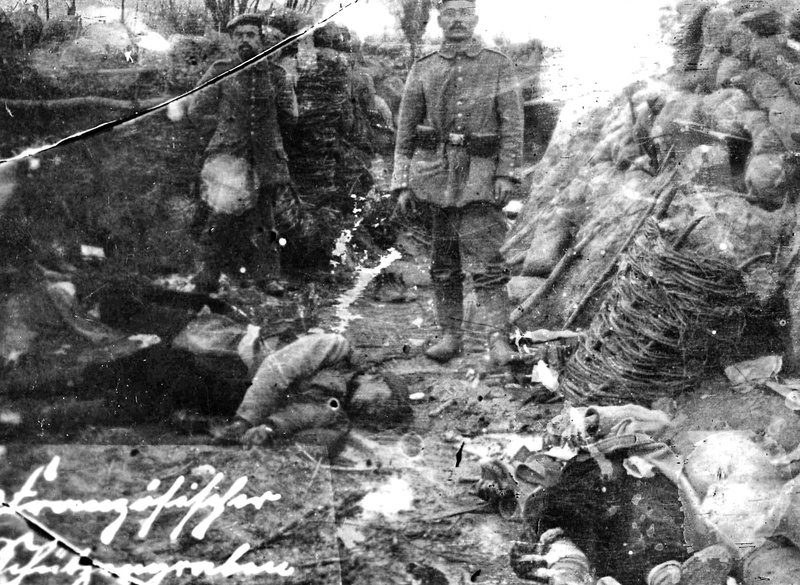 But while there was success on the battlefield casualties were high; more than 45,000 soldiers of the CEF were killed, wounded or missing at this time. 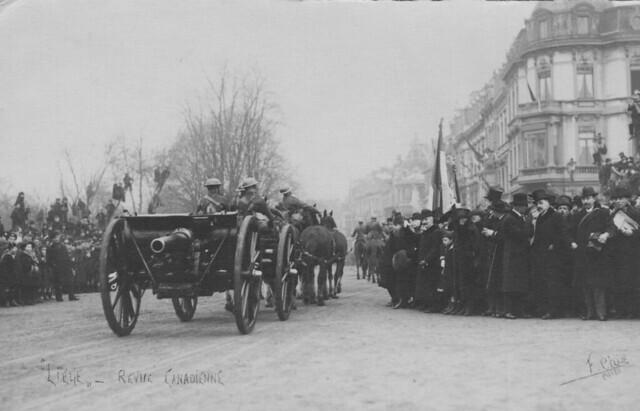 This image shows an 18-pounder field gun from the Canadian Field Artillery parading through Liege just after the end of the war. 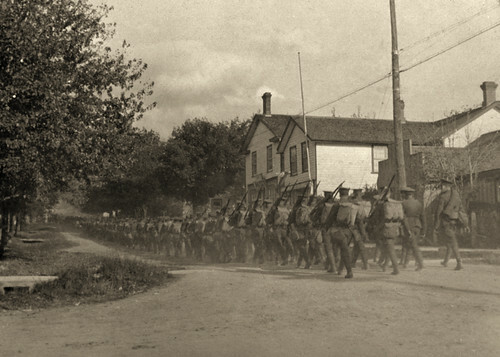 After the Canadian capture of Mons on 11th November their forces moved through several Belgian towns and cities and the local population, as this image shows, often came out to greet them. Taken at one of the many temporary photographic studios close to the Somme battlefield, this image shows three Sergeant Majors of the 20th Battalion Canadian Infantry CEF on the eve of marching to take part in the attack on Courcelette, on 15th September 1916. On this day the 20th helped capture the village and over the next month were heavily involved in the continued fighting for Regina Trench. 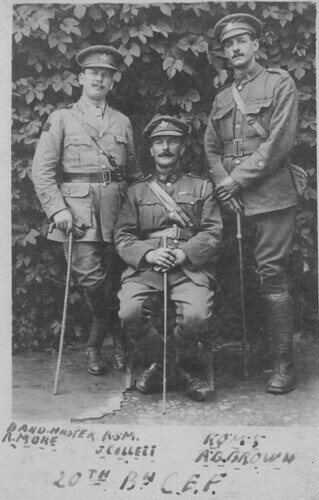 All three men in the photograph were old soldiers and were now senior Warrant Officers in the battalion. Bandmaster R. More (left) was the Warrant Officer Class 1 in charge of the battalion band, which played in camp when out of action and provided men as Stretcher Bearers on the battlefield. Regimental Quarter Master Sergeant A.B. Brown (right) was ‘Quarters’ the man who ensured the battalion got its quota of food, equipment and ammunition. In the centre is the ‘Regimental’ – Regimental Sergeant Major J. Collet. Having had a long career in the British Army, Collett saw the 20th through some tough battles on the Western Front and was decorated with the Military Cross for bravery in the fighting at Courcelette. All three men survived the war and were typical of the tough warriors that made up the CEF on the Somme in 1916. Following the dispatch of the 1st Canadian Division to Britain in 1914, thousands of men of military age living in Canada flocked to enlist in the opening months of the war. These recruits were used to form further battalions of the CEF and within a year three full infantry divisions were created, with room for more expansion as the war continued. 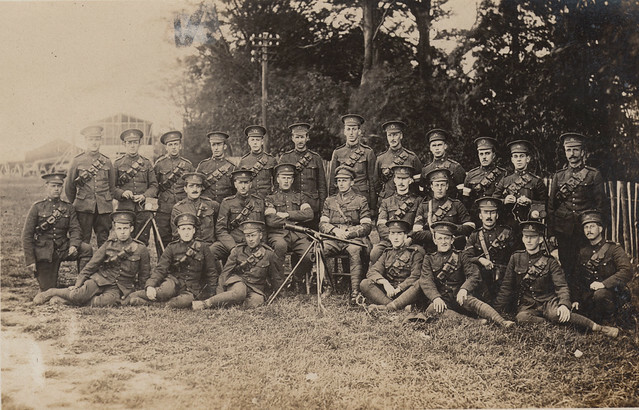 In total more than 260 infantry battalions were formed by the end of the conflict. Not every Canadian battalion could go overseas, however. These are men of the 76th Battalion Canadian Infantry. Formed at Niagara Camp in the summer of 1915, the unit trained for war service and then disbanded in 1916 when its personnel were absorbed by the 36th Battalion which was by then in Britain. The 36th did not serve outside of Britain, it’s personnel being posted to battalions of the CEF on the Western Front. It was therefore common for men in the CEF to serve in several units before they got to an ‘active’ one on the battlefield. 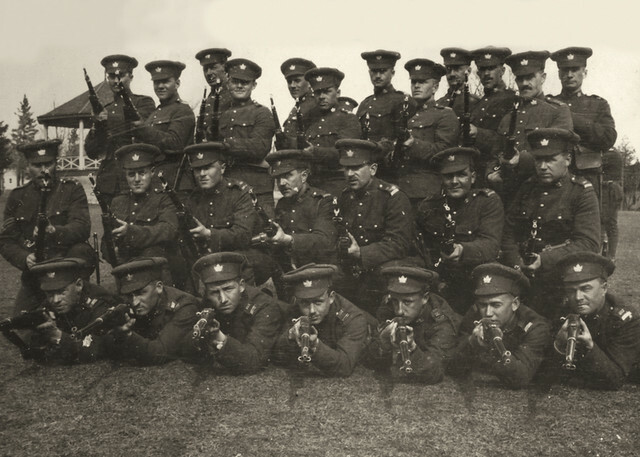 The 76th Bn CEF in training 1915. The arrival of thousands of Canadian troops in 1914 was a welcome addition to the forces of Great Britain and the Empire, but with the expansion of the British Army at the same time, there were accommodation issues when the Canadians first arrived. Sent to Salisbury Plain, some of the original billets were quite simple, but as the size of the CEF expanded, their camp did as well. 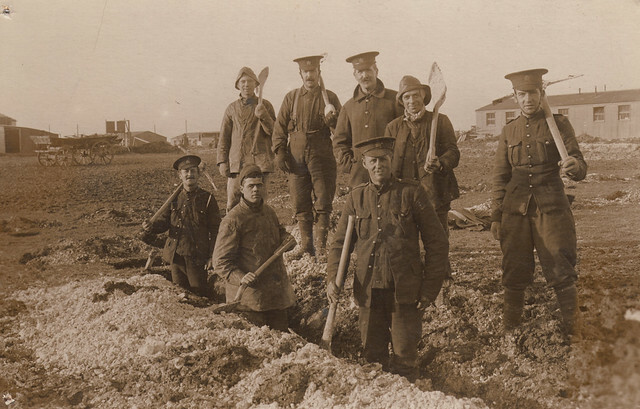 Training continued at a high pace and while many original CEF men were ex-regular soldiers or former members of the Canadian Militia, one thing they rapidly had to learn more about, as the war on the Western Front went static during the winter of 1914/15, was digging in. Here a group of Canadians are practicing trench digging in quite good ground. 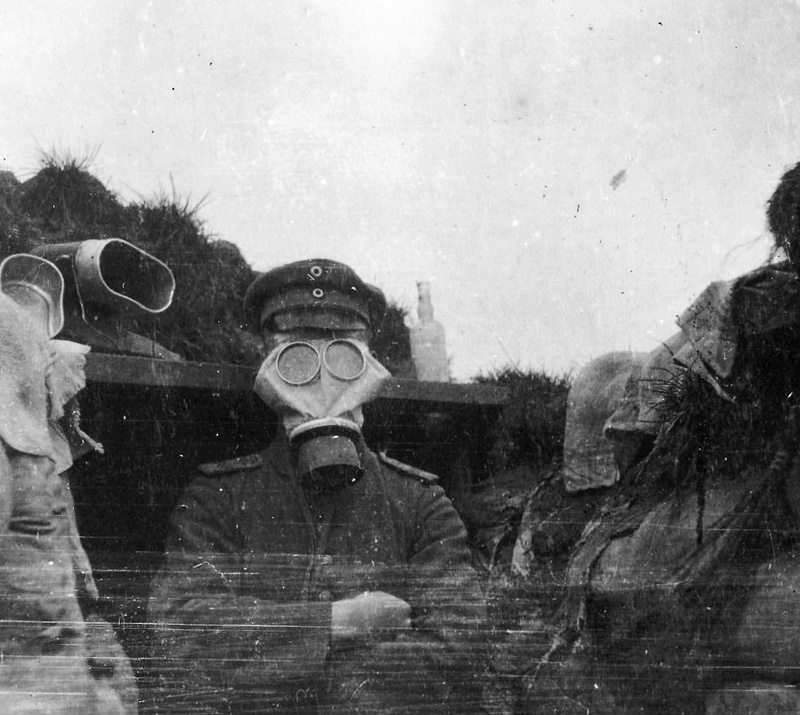 Within months they would be in the mud of Flanders, a very different experience from trench digging on Salisbury Plain during that first winter of the war.